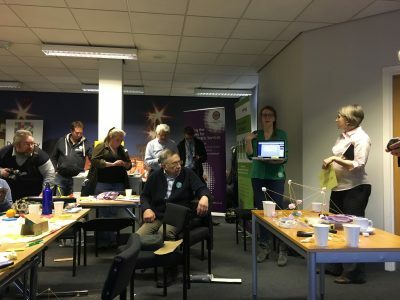 When I started a survey of hackathons as part of the Ardler Inventors project last year, Notwestminster’s Maker Day was the first event I visited. Bringing together a mixed audience of councillors, local government employees, activists, coders and academics together to imagine different futures for local democracy was a perfect fit for our project. Afterwards, I went on to survey a whole series of hackathons to figure out how they were managing to engaging diverse audiences, before we developed our own Ardler Inventor Days to use these events for community innovation. So it was great to be able to close the circle by feeding our findings back into this year’s Notwestminster by helping to run the events, which had been re-imagined as a Design Experiments Day. Notwestminster is an annual event designed to bring people and ideas together around strengthening local democracy. Although the main event runs as a series of workshops and talks, the Maker Day is a hackathon-style fringe event . The event has only run for a few years and continues to evolve, but for the past year, Dave McKenna has been promoting his idea of design experiments, which are effectively small scale pilots of some of the ideas that are generated during their events. For us, this is our natural way of working, so we were happy to help support the event. Get outside the venue and actually engage with members of the public. Prototype something that captures the essence of your idea. Learn something that can be taken forward next time. So in the spirit of acting and reflecting: what did we learn? Firstly, it’s hard to stop talking and start doing. But that’s okay. We’d wanted teams at the event to actually prototype something, but that didn’t need to be digital: it might be a mock-up or prop that helped to explain the idea, or prototyped content, like videos or stories. But some teams—including the one I was part of—still spent much of the day talking through potential ideas and the issues they raised. We think the most important thing was that teams weren’t forced into working with particular media or technologies. The very varied audience means people arrive with different skills and comfort zones, but we can try to give them a rich set of tools to work with and hope they might pick up something new. Next, if you want people to go outside and talk to people, February isn’t necessarily the best time to do it. (Although it only snowed for a little while, so I don’t know what anyone had to complain about…). In future, I think it would be great to link the making day more strongly to the main event on the following day. Maybe doing some of the testing of prototypes and ideas the following day, rather than inflicting them on unsuspecting and cold members of the public would help connect the two days and help raise awareness of the maker day. Finally, these types of event always make me reflect on the relationship between digital democracy research and practice. There were relatively few researchers are the event, and those who were tended to be from politics backgrounds. HCI has taken a keen interest in politics and localism in recent years, but I still feel like there’s a big gulf between these communities. 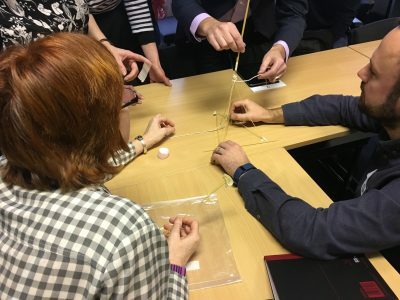 In particular, I noticed that a lot of the attendees were from smaller councils (especially Kirklees), who stuck me as much more flexible and agile than the larger city councils that I’ve tried to work with. The way they’ve embraced design experiments makes me think there’s a lot of room here for academic collaboration, possibly in helping to design and evaluate good experiments. This entry was posted in Ardler Inventors, Civic Technology, Public Engagement and tagged hackathons, Notwestminster by Nick Taylor. Bookmark the permalink.